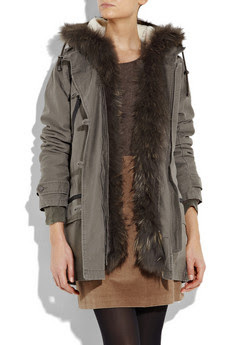 I absolutely love this parka. I went to check out the Maje store in town but they didn't have it anymore- no surprise considering the sales are coming to an end. I was devasted! I was getting all excited while I was on my way there and I did see a similar coat in the window but it turned out to be a lot different and with a tartan print inside. Okay I'm part scottish but I'm not that into tartan. A friend of mine found the parka on their online store. It was going for half price! But of course they didn't have the colour I wanted and they were all sold out. Net a porter are selling the parka for 420EUR but it's currently unavailable.. Yes 420 is a lot for a parka so hopefully it comes back in stock on the Maje website because it was a tad cheaper there. Hah, by the time I save up enough money it'll be time to bring out the denim shorts and sunglasses.